3. Review and Discussion of Possible Revisions to the Continuing Education Regulations for Approving Continuing Education Providers. 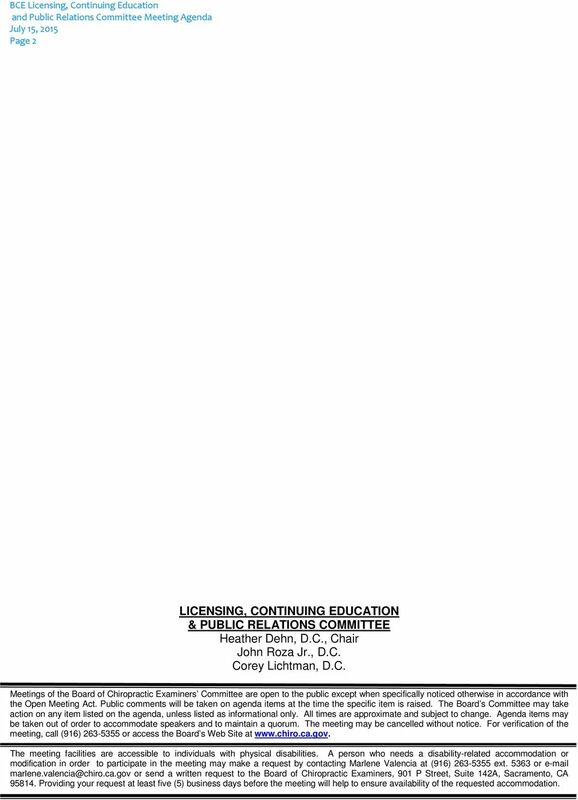 Download "3. Review and Discussion of Possible Revisions to the Continuing Education Regulations for Approving Continuing Education Providers." 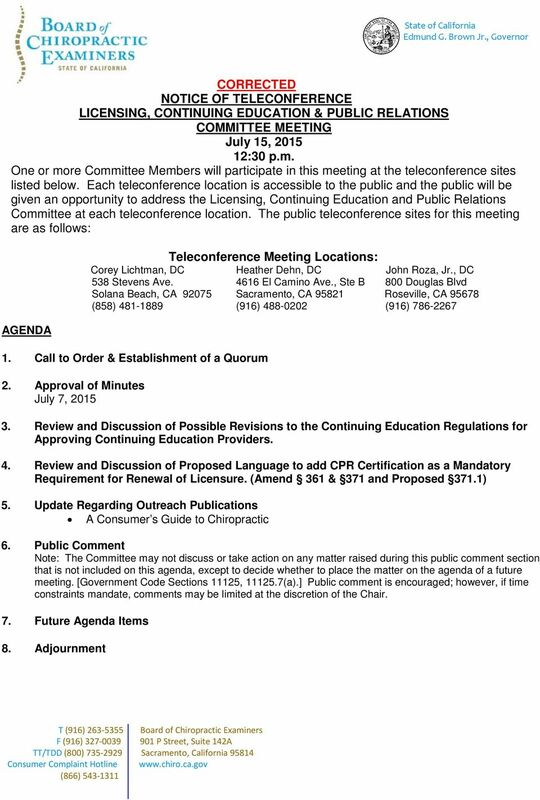 2 BCE Licensing, Continuing Education and Public Relations Committee Meeting Agenda July 15, 2015 Page 2 LICENSING, CONTINUING EDUCATION & PUBLIC RELATIONS COMMITTEE Heather Dehn, D.C., Chair John Roza Jr., D.C. Corey Lichtman, D.C. 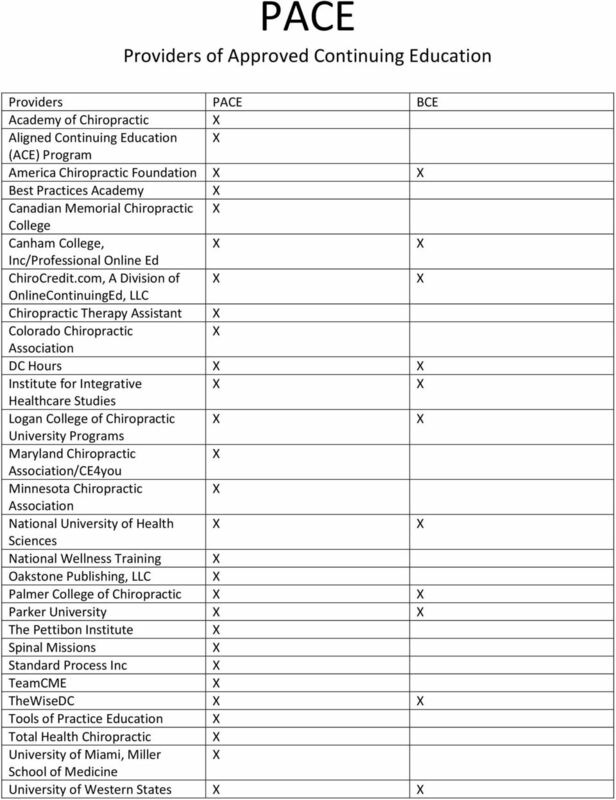 Meetings of the Board of Chiropractic Examiners Committee are open to the public except when specifically noticed otherwise in accordance with the Open Meeting Act. Public comments will be taken on agenda items at the time the specific item is raised. The Board s Committee may take action on any item listed on the agenda, unless listed as informational only. All times are approximate and subject to change. Agenda items may be taken out of order to accommodate speakers and to maintain a quorum. The meeting may be cancelled without notice. 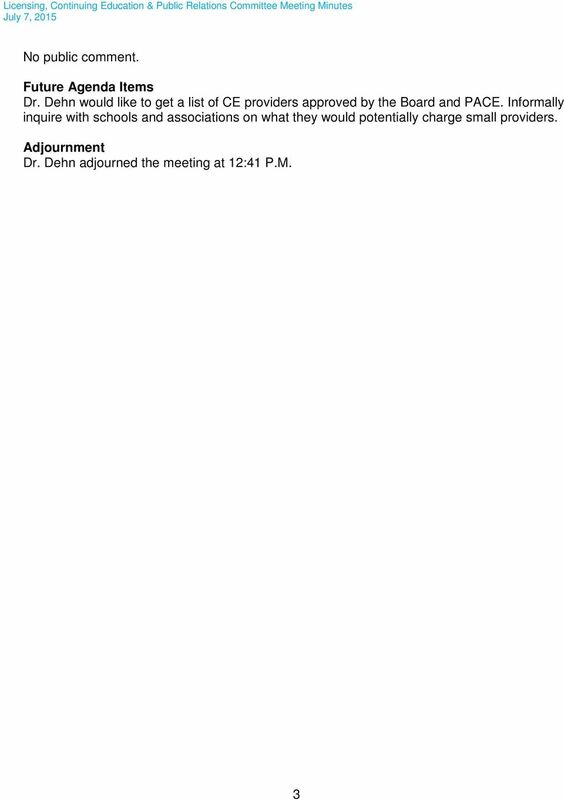 For verification of the meeting, call (916) or access the Board s Web Site at The meeting facilities are accessible to individuals with physical disabilities. A person who needs a disability-related accommodation or modification in order to participate in the meeting may make a request by contacting Marlene Valencia at (916) ext or or send a written request to the Board of Chiropractic Examiners, 901 P Street, Suite 142A, Sacramento, CA Providing your request at least five (5) business days before the meeting will help to ensure availability of the requested accommodation. 8 (1) Completed the board's continuing education requirements and CPR/Basic Life Support certification requirements, specified in section 371.1, that were in effect at the time of each license renewal period; (2) Practiced in another state under an active valid license and completed all continuing education requirements for that state for each license renewal period the license was expired; (3) Passed the National Board of Chiropractic Examiners (NBCE) Special Purposes Examination for Chiropractic examination within six (6) months prior to submitting the Application for Restoration of License. 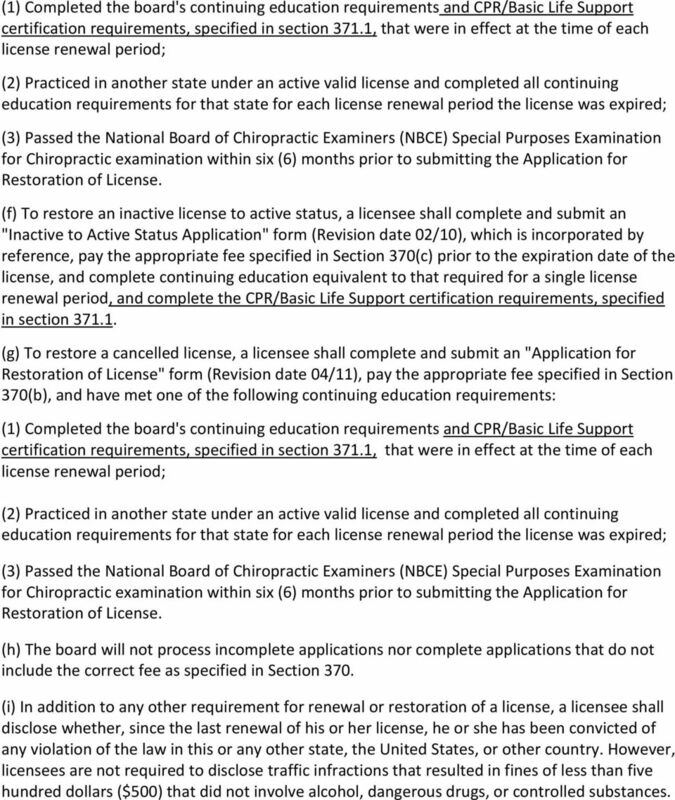 (f) To restore an inactive license to active status, a licensee shall complete and submit an "Inactive to Active Status Application" form (Revision date 02/10), which is incorporated by reference, pay the appropriate fee specified in Section 370(c) prior to the expiration date of the license, and complete continuing education equivalent to that required for a single license renewal period, and complete the CPR/Basic Life Support certification requirements, specified in section (g) To restore a cancelled license, a licensee shall complete and submit an "Application for Restoration of License" form (Revision date 04/11), pay the appropriate fee specified in Section 370(b), and have met one of the following continuing education requirements: (1) Completed the board's continuing education requirements and CPR/Basic Life Support certification requirements, specified in section 371.1, that were in effect at the time of each license renewal period; (2) Practiced in another state under an active valid license and completed all continuing education requirements for that state for each license renewal period the license was expired; (3) Passed the National Board of Chiropractic Examiners (NBCE) Special Purposes Examination for Chiropractic examination within six (6) months prior to submitting the Application for Restoration of License. (h) The board will not process incomplete applications nor complete applications that do not include the correct fee as specified in Section 370. 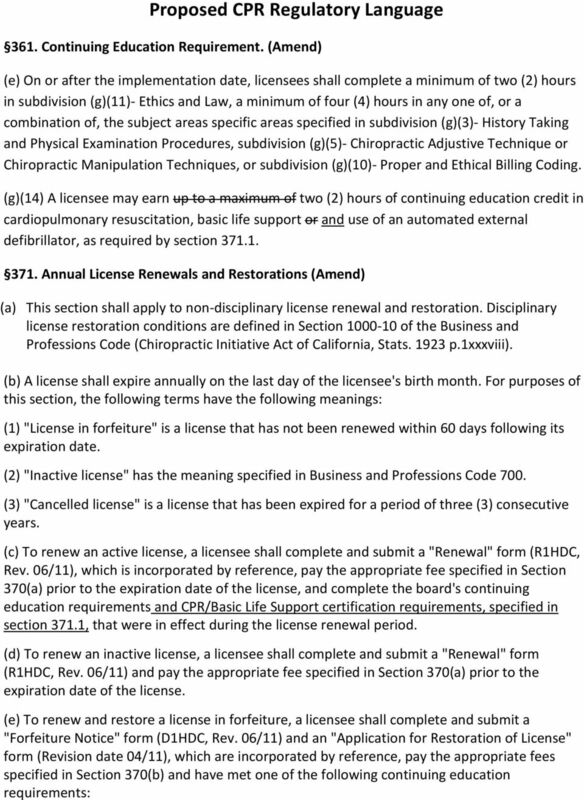 (i) In addition to any other requirement for renewal or restoration of a license, a licensee shall disclose whether, since the last renewal of his or her license, he or she has been convicted of any violation of the law in this or any other state, the United States, or other country. However, licensees are not required to disclose traffic infractions that resulted in fines of less than five hundred dollars ($500) that did not involve alcohol, dangerous drugs, or controlled substances. 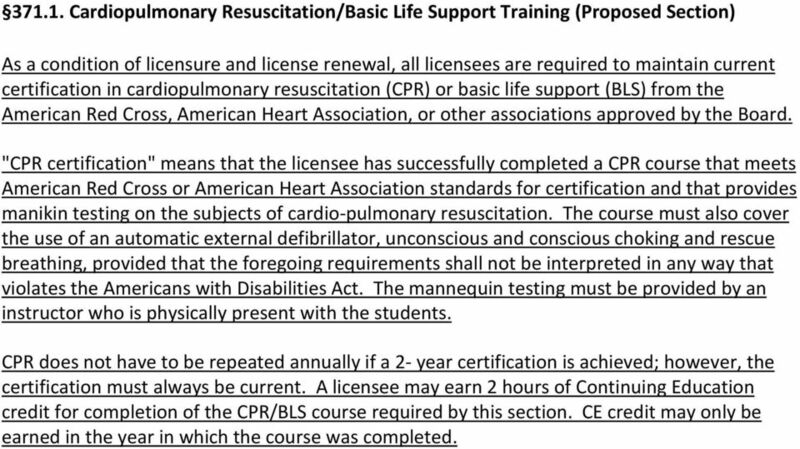 9 Cardiopulmonary Resuscitation/Basic Life Support Training (Proposed Section) As a condition of licensure and license renewal, all licensees are required to maintain current certification in cardiopulmonary resuscitation (CPR) or basic life support (BLS) from the American Red Cross, American Heart Association, or other associations approved by the Board. "CPR certification" means that the licensee has successfully completed a CPR course that meets American Red Cross or American Heart Association standards for certification and that provides manikin testing on the subjects of cardio-pulmonary resuscitation. The course must also cover the use of an automatic external defibrillator, unconscious and conscious choking and rescue breathing, provided that the foregoing requirements shall not be interpreted in any way that violates the Americans with Disabilities Act. The mannequin testing must be provided by an instructor who is physically present with the students. CPR does not have to be repeated annually if a 2- year certification is achieved; however, the certification must always be current. A licensee may earn 2 hours of Continuing Education credit for completion of the CPR/BLS course required by this section. CE credit may only be earned in the year in which the course was completed. 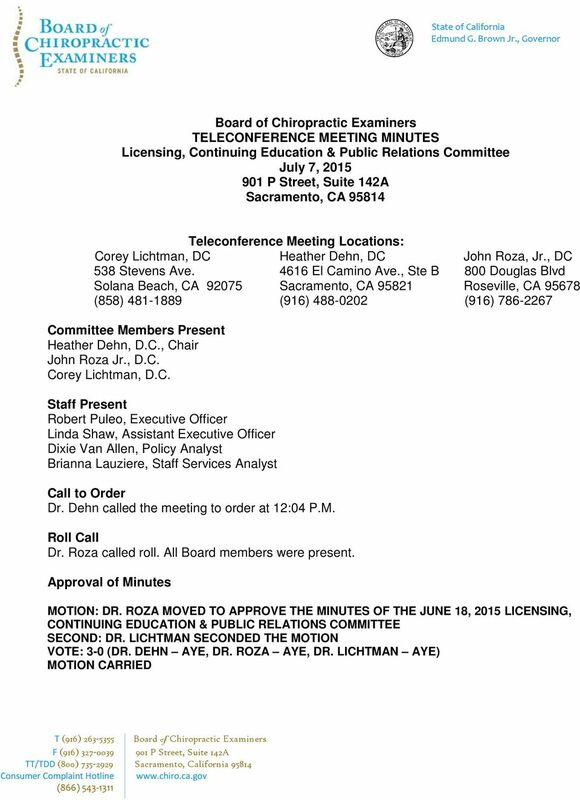 BOARD MEETING MINUTES Friday, January 9, 2015 1:00 p.m.
CHIROPRACTIC EXAMINING BOARD MEETING MINUTES DECEMBER 22, 2015. Kelly Brown; John Church, D.C; Jeffrey Mackey, D.C.; and Patricia Schumacher, D.C.
Lawrence O Connor, D.C. Thomas A. Senatore, Sr., D.C. Albert Stabile, Jr., D.C. Brett A. Wartenberg, D.C. James L. Winters, D.C. Newsletter Summer 2011 MARYLAND ACUPUNCTURE BOARD OUR FUTURE NEWSLETTERS ARE GOING GREEN! BOARD CONTACT NUMBERS: TELEPHONE: 410-764-4766 TOLL FREE: 1-800-530-2481 FAX: 410-358-7258 WEBSITE: www.dhmh.state. The North Carolina Board of Massage and Bodywork Therapy met in Open Session in the offices of the Board on October 18, 2012 at 10:00 a.m. The North Carolina Board of Massage and Bodywork Therapy met in Open Session in the offices of the Board on June 16, 2011 at 10:00 a.m. 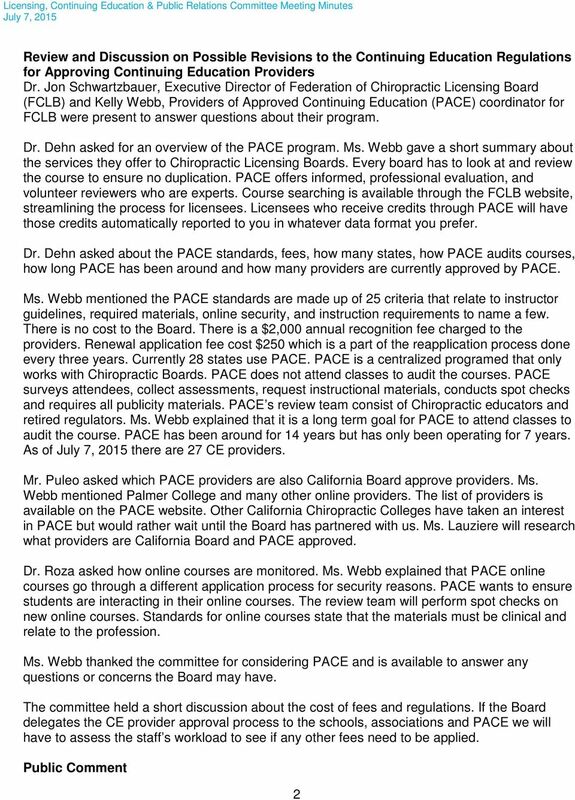 The North Carolina Board of Massage and Bodywork Therapy met in Open Session in the offices of the Board on June 13, 2013 at 10:00 a.m.
State of Oregon - Board of Licensed Social Workers 3218 Pringle Rd. SE, Ste. 240, Salem, OR 97302 (503) 378-5735 Oregon.BLSW@state.or.